Nutritional yeast and turmeric are not the only yellow/orange ingredients in town. In addition to rounding out the flavor of a cheese sauce, roasted red pepper contributes to the tell-tale orange mac and cheese glow. This Roasted Red Pepper Mac and Cheese by Erin Wyso at Olives for Dinner will set you on the right track! So bummed I just found your blog, but glad I get to browse through all your cute cartoons! 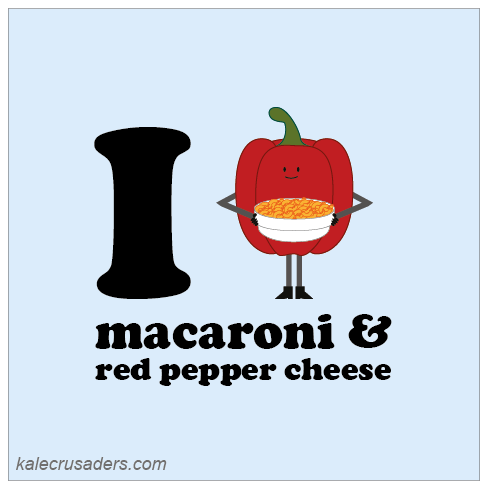 Was planning on making some version of mac and cheese tomorrow night - will have to go through and choose one now. So glad that you found us! We hope you find the mac and cheese of your dreams. We'll be back tomorrow with a brand new post-MoFo cartoon!